Is your surname Kostka h. Dąbrowa? Also Known As: "Saint Stanislaus Kostka"
Stanisław Kostka S.J. (28 October 1550 – 15 August 1568) was a Polish novice of the Society of Jesus. In the Catholic Church he is venerated as Saint Stanislaus Kostka. He was born at Rostkowo, Przasnysz County, Poland, on 28 October 1550; died at Rome during the night of 14–15 August 1568. 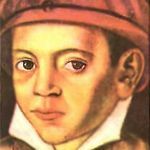 He entered the Society of Jesus in Rome on his 17th birthday (28 October 1567), and is said to have foretold his death a few days before it occurred.